Every year we cut snowflakes after Thanksgiving for our Christmas decorations and this year was no different! Here is this year's Snowflake display in all it's sparkly glory! Every year our display looks a little different but it's twinkly and magical and one of my favorite Christmas decorations every year. As the kids get older the snowflakes become more and more intricate. I save some of the best specimens from year to year, but most of them are cut fresh for the season. 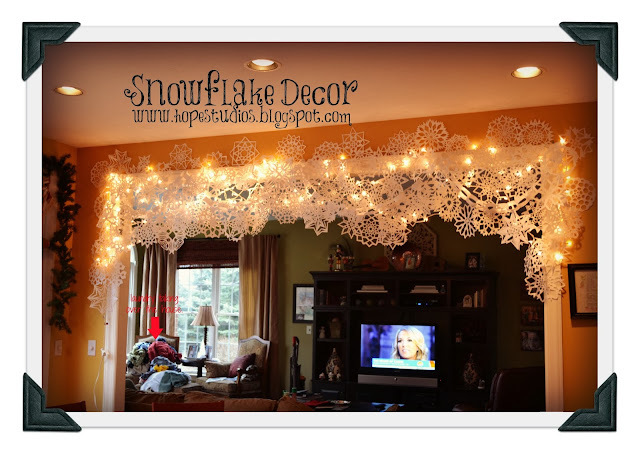 I've talked about our snowflakes before here and here and here and reminded you how to make them here and even taught you How To Make Giant Snowflakes there. So, what are you waiting for? Get to cutting!